Our lab publishes research on (1) Rational Thinking, Decision-Making, and Cognitive Abilities, as well as (2) ADHD and Developmental Psychopathology. Some of our research papers reflect an overlap in these two domains of research, which we mark with an asterisk (*) at the end of the citation. Stanovich, K. E., West, R. F., & Toplak, M. E. (2016). 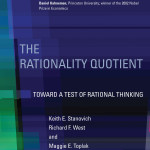 The Rationality Quotient (RQ): Toward a Test of Rational Thinking. Cambridge, MA: MIT Press. Toplak, M. E. & Weller, J. (Editors) (2016). 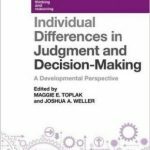 Individual Differences in Judgment and Decision Making: A Developmental Perspective. London: Psychology Press. Stanovich, K. E., West, R. F. & Toplak, M. E. (2014). Rationality, intelligence, and the defining features of Type 1 and Type 2 processing. In J. Sherman, B. Gawronski, & Y. Trope (Eds. ), Dual processes in social psychology. New York: Guildford Publications Inc.
Toplak, M. E., West, R. F., & Stanovich, K. E. (2014). Assessing the development of rationality. In H. Markovits (Ed. ), The developmental psychology of reasoning and decision-making (pp. 7-35). Psychology Press. Stanovich, K. E., West, R. F. & Toplak, M. E. (2011). The assessment of rational thought. In K. E. Stanovich, Rationality and the reflective mind. New York, NY: Oxford University Press. Stanovich, K. E., West, R. F., & Toplak, M. E. (2011). Individual differences as essential components of heuristics and biases research. In K. Manktelow, D. Over, & S. Elqayam (Eds. ), The science of reason (pp. 355-396). New York: Psychology Press. Stanovich, K. E., Toplak, M. E., & West, R. F. (2010). Contaminated mindware: Thinking biases of the cognitive miser. Rotman Magazine, Winter, 16-21. Ilie, Gabriela, Vingilis, E. R., Mann, R. E., Hamilton, H., Toplak, M., Adlaf, E. M., Kolla, N., Ialomiteanu, A., van der Mass, Asbridge, M., Vingilis-Jaremko, L., Rehm, J., & Cusimano, M. D. (2015). The association between traumatic brain injury and ADHD in a Canadian adult sample. Journal of Psychiatric Research, 69, 174-179. Vingilis, E., Erickson, P.G., Toplak, M. E., Kolla, N. J., Mann, R. E., Seeley, J., vanderMaas, M., & Daigle, D. S. (2015). Attention Deficit Hyperactivity Disorder symptoms, comorbidities, substance use, and social outcomes among men and women in a Canadian sample. BioMed Research International. Sorge, G.B., van der Maas, M., Flora, D.B., Vingilis, E., Mann, R. E., Erickson, P., Jain, U., Kolla, N., Seeley, J., & Toplak, M. E. (2015). Using factor analytic models to examine the association between Attention-Deficit/Hyperactivity Disorder symptoms and health-related outcomes in a representative population survey. ADHD Attention Deficit Hyperactivity Disorders, 7(3), 225-235. Vingilis, E., Mann, R. E. Erickson, P. Toplak, M., Kolla, N. J., and Seeley, J. (2014) Attention Deficit Hyperactivity Disorder, other mental health problems, substance use and driving:Examination of a population-based, representative Canadian sample. Traffic Injury Prevention, 15:sup1, S1-S9, DOI:10.1080/15389588.2014.926341. Sorge, G. B., Moore, T., & Toplak, M. E. (2009). Comparing the content of parenting self-help programs to evidence-based parenting programs: Understanding the efficacy of self-help advice. The Scientific Review of Mental Health Practice, 7, 26-36.